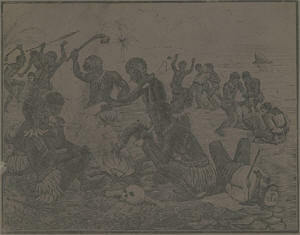 hibition, were obtained from the king of one of the Cannibal Islands, where they were captives taken in war, and, by the laws of Cannibal warfare, were doomed to death. Barnum was obliged to give heavy bonds that, at the expiration of their three years' reprieve, he would return them. In the operation, he claims double credit as a humanitarian; first, he does not furnish them with their regular diet of roast missionary; and, second, he proposes to forget his bond, and not return them to tickle the palates of their epicurean captors. He considers this breach of contract justifiable, as he is willing to pay the amount nominated in the bond, especially if the investment proves a profitable one. Published by E and HT Anthony. Ko Ratu Masi Moa - Ki Na Bose Yaco. By James W. Shettel. Circus Scrap Book, Vol. 1, No. 4 (Oct), 1929, pp. 43-50. The Barnum Museum, Menagerie and World's Fair, in its second anuual tour of the United States arrived May 14, 1872, in York, Pa., where it was to give performances in the morning, in the afternoon and at night. Posters on dead walls and handbills distributed around the town and neighboring country had proclaimed the fact that the show was "positively the largest and most attractive combination of exhibitions ever known and without a parallel in the history of the world." By means of the press and posters interest was worked up to a high pitch. It was not a little cause of wonder that the "combination" was to arrive by rail, for only once before - about 17 years previously - had a circus, the Spaulding and Rogers, been transported to York in cars. All others had travelled in wagons. The shrewd Barnum, whose agents had been liberal in bestowing free passes among the ministers, boldly announced that his "was the only exhibition in America recognized and endorsed by both the religious and secular press and daily visited by eminent clergymen." This pronouncement was not without its influence upon a church-going community, to a part of which circuses had generally heretofore been taboo, although menageries were an allowable diversion because they were instructive. Barnum seems at this time to have recognized the fact that a certain class in every community disapproved of the circus and made a distinct effort to overcome this prejudice. The word, "circus," an investigation shows, had a small part in the advertising. Attention was directed principally to the merits of the museum, menagerie and world's fair, "exhibited in six separate colossal tents." 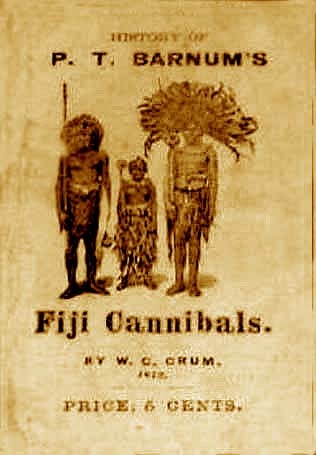 The Four Wild Fiji Cannibals, Captives of War, lately ransomed from King Thakembau, by Mr. Barnum at a cost of $15,000. Live Digger Indian from the Yosemite Valley. The Only Giraffe in America. The Only Group of Living Monster Sea Lions kept in Massive Water Tanks. The Famous Riding Goat, Alexis. The Wonderful African Snake Charmer. Of the Fijis, Barnum had written in his book, which was sold at the circus: "I have tried in vain for years to secure specimens of these man eaters. At last the opportunity came. 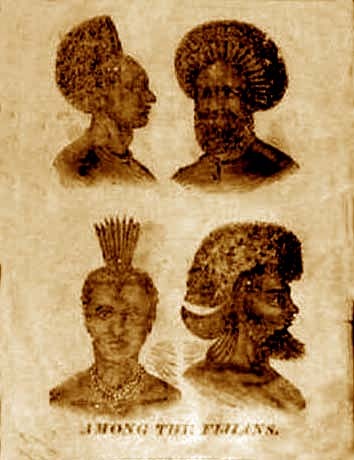 Three of these cannibals having fallen into the hands of their Royal enemy, who was about to execute and perhaps to eat them, the missionaries and my agents prevailed upon the copper-colored king to accept a large sum in gold on condition of his majesty granting them a reprieve and leave of absence to America for three years, my agent also leaving a large sum with the American consul to be forfeited, if they were not returned within the time stipulated. "Accompanying them is a half-civilized Cannibal woman, converted and educated by the Methodist missionaries. She reads fluently and very pleasantly from the Bible printed in the Fijian language and she already exerts a powerful influence over these savages. They take a lively interest in hearing her read the history of our Saviour. They earnestly declare their convictions that eating human flesh is wrong and faithfully promise never again to attempt it. They are intelligent and docile. Their characteristic war dances and rude marches, as well as their representations of cannibal manners and customs are peculiarly interesting and instructive. It is perhaps needless to add that the bonds for their return will be forfeited. They are already learning to speak and read our language and I hope soon to put them in the way of being converted to Christianity, even if by so doing the title of "Missionary" be added to the many already given me by the public." "The day was pleasantly cool and agreeable and thousands of people from the rural districts poured into town at an early hour. The huge canvas, under which the attractive sights were to be seen, covered a large portion of the (Civil War) hospital grounds and immediately after the hour of opening, dense masses of human beings thronged in its direction and soon filled every available space and avenue leading to and from the different places of exhibition. "The presence of such an immense concourse of people, representing every district in our large and populous county, was itself worth the price of admission, but when the wonders which Barnum had collected and brought together from the remotest and most distant parts of the world, burst upon the eye, the spectators were more than satisfied that taking it all in all, they ne'er should look upon the like again. It was decidedly the greatest and most complete combination which has ever been seen in York and will certainly hold preeminence over all exhibitions until Barnum comes again. "An attempt to give a detailed description of the great show is impossible and will, therefore, not be attempted, nor is it necessary, as those who care to have anything said about it in these columns were no doubt present and saw it. "The museum was an object of interest to many, who lingered long in their examination of its wonders and curiosities, while there were others who passed it by without deigning once to pause for a moment, in their desire to reach other departments, which to them were more attractive. "The collection of living animals, found under canvas No. 2, was very fine and there were some specimens in it, which had never been seen in this latitude before. The sea lions were objects of special interest and attracted far more than usual attention. They kept up considerable noise during the exhibition and manifested a great deal of uneasiness, and from their frequent divings into their tank, it is judged they miss the ice of their native Alaska, in which alone, it seems, they can thrive and be comfortable. They are a hardy animal, and it is doubtful if they will live long in this climate. Whether Barnum will succeed in piloting them through the hot summer that is before us is exceedingly questionable. "The canvas under which the circus or hippodrome was held was spread over an immense area and was capable of seating at the lowest calculation 5,000 persons. It was filled to overflowing. There was scarcely a seat unoccupied. This branch of the exhibition has an advantage over all others of the, kind, yet seen here, in its high moral tone and bearing and in the entire absence of anything and everything, which could be calculated to displease the most fastidious. Quite a number of the clergymen of the town and from the country were present and seemed to enjoy themselves amazingly. The performances were exceedingly chaste and interesting. "The riding goat, Alexis, did his part remarkably well, although the poor little fellow did get a tumble from his horse, which alarmed him for the time being very considerably. The performance throughout, - riding, tumbling and the doings of the elephant and trick horse - gave universal satisfaction; and the appearance in the arena of the armless woman, the bearded child, the man in miniature, the strange and brainless being, Zip, said to have been captured somewhere in Central Africa, and whose face and head are scarcely human, were never witnessed here before. The sixteen huge camels and dromdaries, richly caparisoned, as they swung around the circle, excited much interest and attracted a large amount of attention. They were the finest looking, most perfectly formed and seemingly healthy animals of the kind ever seen. "Much more might be written about Barnum and his great combination, but as his name and fame are world-wide and he is known to be a man who never does things by halves, it can only be added that this exhibitions is the greatest in the country, as any one will be convinced by a visit." 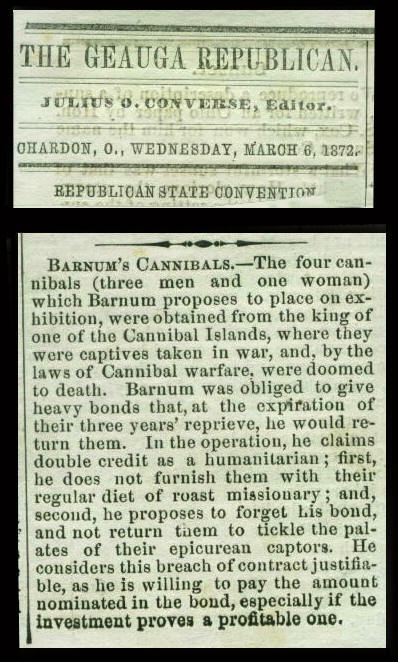 "Barnum's Museum, Menagerie and Hippodrome met with quite a loss yesterday," said the Daily, "in the death of the notorious cannibal dwarf, which occurred at the Pennsylvania hotel. The little Fiji exhibited symptoms of indisposition several days ago, and the manager, W. C. Coup, sent 'the General,' as he is called to New York to be cared for by Mr. Barnum's family physician. But the little savage, becoming restless in the absence of his associates, he was returned to the company. Like all of his race, he had a native horror of shoes and clothing and even in the wet, cold days that came upon the company in New Jersey, the manager was unable to force shoes upon 'the General' and make him dress with sufficient warmth. "Yesterday, the man in charge noticed that his fingers were constantly in motion, while he muttered continuously the only word he pronounced intelligently, 'Fiji.' He refused anything like food or nourishment and apparently thought of nothing but his native island. Dancing or violent gesturing of any kind was always a source of great merriment to 'the General,' but now the keeper could not provoke even a smile. The miniature being was dying and while the keeper was doing his best to cheer him up and make him take his medicine, he rose up in bed, muttered 'Fiji' in a whisper and fell back dead. His three native companions, who up to this time were wholly indifferent, now exhibited all the symptoms of genuine grief. They howled incessantly and such fearful physical contortions were probably never before witnessed in a civilized community. "The death of this dwarf savage was not an unexpected event. The scene subsequent, however, sent a thrill through the very few conversant with the facts. Shortly after the corpse was placed in the coffin last evening, S. S. Smith, the keeper, locked the door upon the three companions in an adjoining room and left the building for the purpose of consulting the manager at the National Hotel. He states that he was not absent 30 minutes, but that upon returning a scene presented itself too horrible to detail. The two male associates had gained access to the corpse and were biting and gnawing at the fleshy parts of the body with all the eagerness of their native cannibalism. The female stood aloof in one corner and by sign, word and gesture was entreating them to desist. It is understood the woman is a convert to the teachings of English missionaries and looks with abhorrence upon all the unchristian habits of her tribe. Mr. Smith promptly interfered and the two miserable beings went sullenly to their apartment. All regret the unnatural affair and none more than the parties directly interested. The remains were buried in the evening." Whatever may have been the purpose of the publication of such a story, it is doubtful if it was realized, unless it was aimed to start a controversy. Surely Barnum took no pride in the work, for in none of his autobiographies has he referred to the incident. The people of York were indignant. They had not only missed seeing the "cannibals," but later learned Barnum had perpetrated one of his humbugs. "A few days ago the York Daily had an article in its columns," said the True Democrat, "stating that the cannibal belonging to the Barnum show that died here last Tuesday, was partly eaten up by his companions, during the temporary absence of their keeper. We have since learned that there is not a word of truth in the story, that the Daily was liberally paid for the insertion and the whole thing was furnished to that paper, cut and dry, by the proprietor, as an advertising dodge. "Barnum, although confessedly a great showman, is determined not to be outdone in the work of humbugging, a reputation for which he has sustained through a long life of singular changes and fluctuations. It is now positively averred that the female member of the cannibal troupe was born in the state of Virginia and was at one time a domestic in the house of a gentleman at present residing in Baltimore. This, had it been known in York last Tuesday, we venture to say, would have raised a loud laugh, if not something worse, at Barnum's expense and his man-eating party." 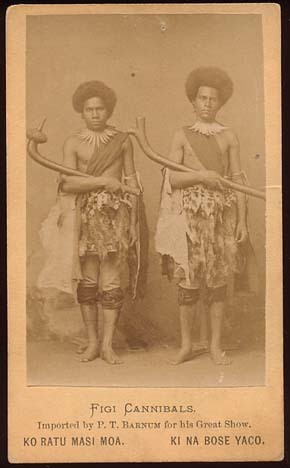 The True Democrat's story, exposing the Fiji humbug, was widely copied by the press and read by as many persons as had been the press agent's yarn in the Daily. Among those under whose observation it came was George Boyne, Sacremento, Cal. 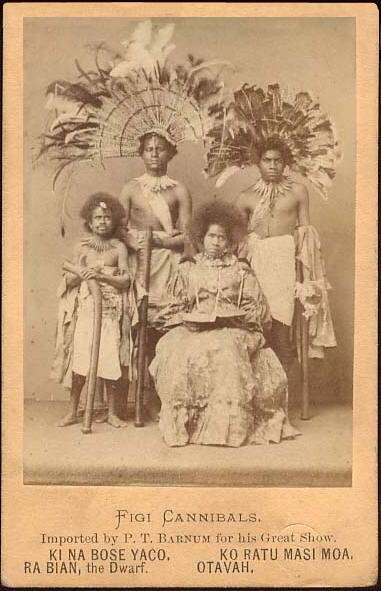 Boyne with a family of six children had resided in the same locality in the Fiji islands, from which "the cannibals" came. He asserted in a letter to the Trut Democrat after giving a personal history of the Fijis accompanying the Barnum show that they had been under Christian training for a number of years. From a personal acquaintance with the Fijis, he was able to speak with authority and declared that town and I am very sure that very few typos would like to reside within a quarter of a mile so near to such people as described in the York Daily. If the deceased dwarf had a native horror of shoes and clothing and in the wet and cold days that came upon the company in New Jersey, the manager was unable to force shoes upon 'the General' and make him dress with sufficient warmth, why is it that in California, which is warmer than your state, the little fellow went in this city with my children to purchase articles of clothing and was always forced to wear them? "The truth is the exigencies of the show will not admit of it. When the Fijians know how they have been placed in this show for years, they will soon despond and there will be another for the Daily to serve up. If they even received pay, it would make no difference, their love for their island home is so strong. "I cannot conceive how they can be kept there by their own free will by a gentleman, who professes Republican principles. I promised the poor woman to send for her when I got home, but I knew she is in too safe keeping to escape, especially as she is of a quiet disposition and lacks confidence among strangers. She could not get away without assistance. I am prepared to send her the means. I thank you for your expose of the late humbug." Potter's field became the burial ground of the little Fiji. It was adjacent to the circus grounds and convenient for the show people who desired to witness the burial. At the time on the islands from which they were brought cannibalism never came under his observation. "The European town of Sevukee, Island of Bralam, Fiji, has a municipal council, mayor, I. Morey. A lodge of Free Masons was opened in due form last December. The lodge was opened by permission of the king. The town possesses two newspapers, the Fiji Times and the Fiji Gazette. "The eldest of Barnum's cannibals lived very near to this there was much said about an appropriate grave stone which Barnum was to purchase to mark the place of burial. This it was expected the great showman would certainly do. The years have, however, passed and there is nothing to distinguish the grave of the Fiji from the hundreds of friendless paupers buried on the plot. Barnum failed to keep his promise. Some years ago Potter's field was moved to a new location north of the city, and it was then that the exact spot where "the General" was buried was identified with great difficulty. All stories are the property of Sideshow WorldTM & their respective authors.